The big names in broadband-enabled smartphones such as iPhone 5, Galaxy S3, Note II, etc, all come equipped with 4G LTE. But none of these are compatible or supported by the local cellular networks. So, in yet another first for Maxis, the leading communications service provider came up with its first 4G phones. 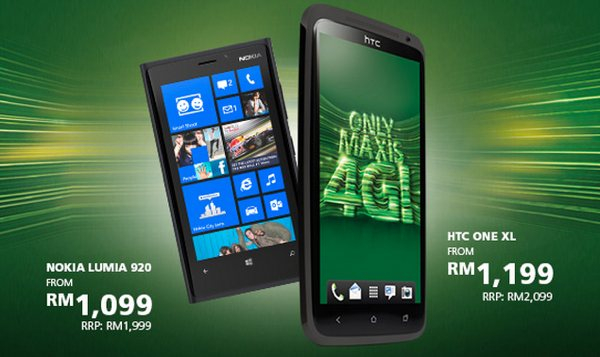 On Friday, Feb 8, Maxis launched two 4G long-term evolution (LTE) smartphones - the Nokia Lumia 920 and HTC One XL. These will be the first two smartphones to be activated on Maxis' 4G LTE network. "Available at Maxis centres in Kuala Lumpur Convention Centre and Taman Tun Dr Ismail, customers can purchase the Nokia Lumia 920 from only RM1,099 with surfmore 75 plan or talkmore78 with 3GB mobile Internet and HTC One XL from RM1,199 with surfmore 75 or talkmore78 plan with 3GB mobile Internet. "We look forward to launching more smartphones and tablets this year on Maxis' 4G LTE network, so customers can enjoy the most superior on-the-go experience," said Maxis Joint Chief Operating Officer Suren J Amarasekera. What? My favourite smartphones are not in the list? Disappointed that your iPhone or Galaxy S3 are not activated on Maxis' 4G network? Maxis said, "Through our strong partnership with leading device manufacturers and content players, Maxis is indeed well-placed to provide customers with a richer, on-the-go Internet experience." So, yes, maybe in the near future your gadget will also be listed. But then Maxis is not the only player that can offer 4G LTE connectivity. DiGi, P1, Unifi and Celcom are almost sure to come up with their own list of devices and plans soon. It's just that Maxis was the first to take the plunge testing the water. Wi-Fi: What are the health risks related to it? What is the highest Voltage ever produced?